In a move to uplift and make Uganda Tourism a competitive sector in the economy, the government has contracted 3 global marketing companies to represent the country in the widely publicized international travel markets. The CEO KPRN, Hanna Kleber (Left) receives a marketing contract from President Yoweri Kaguta Museveni (Centre) as the Board Chairman of Uganda Tourism Board (UTB), James Tumusiime (Right) looks on. 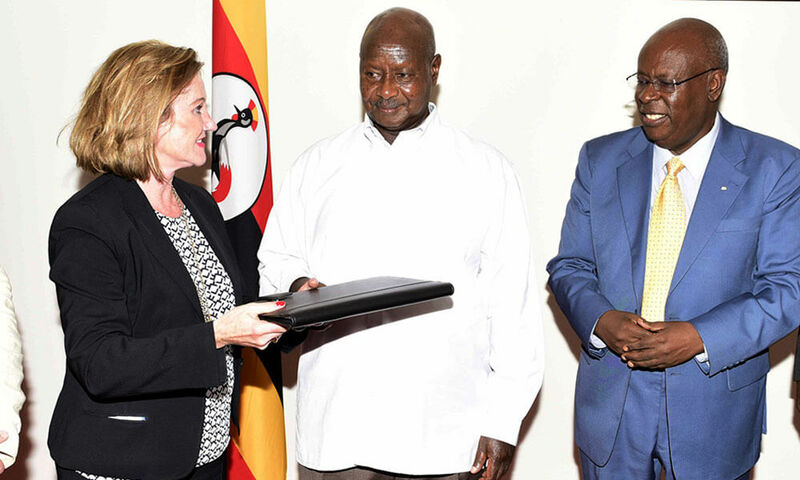 Ugandan President Yoweri Museveni offered the marketing contracts to Performance Horizon Group (PHG) from North America, Kamageo of United Kingdom and KPRN from Germany. These firms were signed up to represent Uganda in the various travel markets at a total sum of USD 1.5 m for twelve months. “Uganda was an easy country to market since it is an all year round tourist destination with great weather conditions, variety of attractions comprising of snow-caped Rwenzori Mountains all throughout the year,” Museveni said in the presence of Hannah Kleber and Tim Henshall, who represented KPRN and Kamageo respectively at the contract hand over function in State House Entebbe. Uganda earns lots of dollars from gorilla trekking tours in Bwindi and Mgahinga National park plus wildlife safaris done at the rest of its eight national park, games reserves. The country also boasts of numerous attractions. The three companies will help the Uganda government in promoting tourism products and services in main source marketplaces of North America (USA and Canada), Ireland, UK, Austria, Germany and Switzerland among others. The whole target of the task is to showcase Uganda as a major safari destination and upsurge tourism arrivals, large local spending and length of stay on vacation by visitors while in the country. The president welcomed the new approach implemented by Uganda to support the country via market representation globally in the major markets. Above the promotion of tourism numbers, the project too seeks out to shape capacity of the local tourism sector and make individual firms stronger players on the universal market. KPRN, Kamageo and PHG will also offer training to Uganda tourism business stakeholders. James Tumusiime, the chairman Uganda Tourism Board (UTB) said the three firms besides promoting Uganda as a tourism destination will also support the country’s foreign missions abroad in doing the same. He said destination marketing is a complicated venture that needs united efforts. He said that the country’s tourism was now becoming a major employer. “Globally, tourism is among the main investment sectors that all countries are striving for a fair share of numbers in terms of visitors and earnings,” Tumusiime asserted. He said the the three companies assigned for marketing were to become the ears, eyes and ambassadors of Uganda worldwide. The Chief Executive Officer (CEO) of Uganda Tourism Board, Stephen Asiimwe said it is going for a single expo was very costly and could not bring returns after a year. He said the marketing companies will make sure ensure destination information and recognition is uninterruptedly promoted via trade, media and other possible platforms. “Uganda is to be effectively represented by partners with fundamental capabilities in travel markets,” These firms will represent Uganda at different for since Asiimwe said. In the past, Uganda has been represented at trade exhibitions, World Travel Market (WTM) in London, ITB Berlin (Internationale Tourismus-Börse Berlin) and Indaba among the many. Museveni advise the urged the Tourism, Wildlife and Antiquities Ministry to act quickly in upgrading the Hotel and Tourism Training Institute (HTTI) found in Jinja to make it well-placed in providing provide quality and trained labour for the promising sector.